Witness the rebirth of your home with Home Renaissance. Located north of Boston, Home Renaissance provides expert home redesign, decorating and staging services that will enhance the attractiveness and livability of that special place you call home. 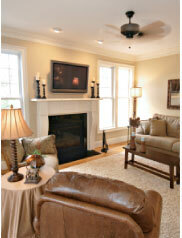 Owner-designer Danielle Lavoie-Purdy is professionally trained in home redesign and staging. She also has extensive experience in the apparel industry, which provides her with a good feel, and a sharp eye for color and selecting fabrics. Danielle believes that the process should never be intimidating, only helpful. Moreover, she understands the emotional connection you have with your home’s belongings, so she makes every effort to find a place for those pieces that you hold dear to your heart. Danielle is excited about the prospects of helping you transform your house into a home. Just the way you always knew it could be – beautiful, warm and inviting -- with an ambiance and flow that will make you feel right at home.